And it sounds fantastic, no? Starch fried in pig fat, and then covered in a flavorful saucy mixture sounds pretty darned heavenly. But when I realized that eating one serving meant that I was likely eating two tablespoons of pork fat, I was appalled. I have my limits and that was just too much. But thankfully I'm not afraid to experiment. Even if it means that I have to try a dish a couple of different ways. I tried baking the plantains and that didn't make them soft. I tried steaming them and that didn't make them soft. I thought if I fried them quickly enough they'd soften and not soak up as much oil. But they ended up soaking up oil and not softening. So then, while brainstorming with a friend, he suggested I try boiling them in a flavorful liquid. So I did that. And whaddaya know? It worked! I was able to get a softer, mashable texture without using a lot of fat. I was thrilled. So I went about making the mixture and then excitedly began to look for authentic Puerto Rican recipes. I saw several calling for shrimp, but I wanted something with chicken in it. And I found a lot of recipes, but they were almost all in Spanish. If you haven't tried running recipes through a translator, you should. It's great times. "It then mashes two times and folds and then it puts the lotion in the basket." Seriously, some things just don't translate well. So I had half of my recipe down, but I still needed the other half. Like many things I make, I decided to just wing it. I looked up "puerto rican stew," found several recipes, and looked for similarities. I settled on making a soupy stew (or a stewy soup) that was tomato-based, with chicken pieces and a flavor base of sofrito. But then I had to find a recipe for sofrito. You can buy it in a jar, but the sauce I found contained MSG and other preservatives, so I figured I could make it myself. Sofrito is a Spanish word that means a well-cooked and fragrant sauce. It's commonly used in Spanish, Haitian, Puerto Rican, Cuban, Greek, and many Caribbean dishes--but of course, it is made up of different things for each cuisine. Puerto Rican sofrito tends to be made up of culantro (not to be confused with cilantro, which is also an ingredient), garlic, green peppers, onion, and vegetable oil. Sometimes these items are all blended together and then cooked in a skillet. Other recipes dictated for the ingredients to be stirred in fresh. Other recipes replaced the vegetable oil with pork fat, to be slowly simmered. Because I was hungry and liked the idea of bright, fresh flavors, I just blended it together. And for less than $2, I got more fresh, preservative-free sofrito than I could get in the small $4.50 jar I found at my local market. I found out (via Twitter) that plantains boiled in broth is very common in making a Dominican dish called "mangú." Preheat your oven to 350˚F. Cut the tips off the plantains. Cut down one of the ridges on the plantain and then cut through about 1/2" away. Repeat this with the other plantain and place them on a baking sheet. Place it in the middle of your oven and let it bake for about 15 minutes. The plantains should turn mostly black and the peel should split away from each other. This trip in the oven doesn't really cook the plantain as much as it makes it easier to peel it. Remove the plantains from the oven and let them cool till they can be handled. Use the tip of a knife and pry out the skinny strip of peel. Use the knife to cut the edges of the remaining peel away from the plantain. Carefully remove the peel, being careful not to burn yourself. Discard the peel and chop the plantains into 1" slices. Place a skillet over medium heat and add the plantains and vegetable broth. Chop the garlic and add it to the pan. Let this cook for about 15 minutes. The plantains should be able to be pierced with a fork. Transfer the plantains to a food processor. Add the salt and up to 1/4 cup of the broth to get it to puree and create a texture that can be mashed and molded into balls. Peel the onion and cut it into quarters before placing it in a food processor. Remove the seeds and stems from the cubanelle pepper. Cut them into 4 pieces and place in the food processor. Peel the garlic and add it to the food processor. Rinse and remove any bad leaves from the cilantro bunch. Core the tomatoes, chop them, and add them to the food processor. Remove the seeds and stem from the bell pepper. Cut it into chunks and add it to the food processor. Pulse a few times after each addition to make sure that there will be room for everything. Once everything is added, pulse several times till you have a chunky puree. Place a large pot or dutch oven over medium heat. Add the chicken broth and the chicken breast. Add enough water so the breasts are covered. Let them cook on medium heat for about 30 minutes. Remove the breasts from the pan and place on a cutting board to cool. Peel the potatoes and cut them into 1/4" cubes and add to the pot. Add in all of the remaining ingredients except for the lime and stir to combine. Once the breasts have cooled, cut them into 1/2" cubes and dd them back to the pan. Lower the heat to medium-low and let this simmer for 45 minutes to an hour.The chicken should be soft, the green olives should be very soft, and the broth should be very flavorful. Remove the bay leaves and squeeze the lime over the dish and stir before serving. 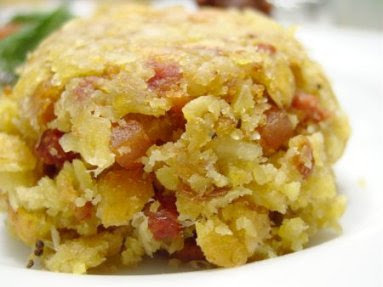 To serve this dish place a ball of the mofongo in your bowl and ladle the Guisada de Pollo over it. Serve with a sprinkle of freshly chopped cilantro on top. I have to say that this dish is quite yummy. Much yummier than I expected. Yummy enough that my inner child who says "ick" occasionally has been sent to her room with no supper. Seriously! When I eat food I make I often mutter throughout the meal what could be done to make things better for next time. But this? This got lots of "This is so good! so good!" And the few people I was lucky enough to share it with agreed. But I make no bones that this is a traditional Puerto Rican recipe, just that it is a common dish served in Puerto Rico. Thankfully, I met a lovely woman who has so kindly agreed to come to my home with her sister and show me how to make a few dishes that her father used to make that she feels are representative of Puerto Rican cuisine. So while we stand over my caldero (pot) and stir, I'll be collecting little tidbits of info to pass on to you, dear reader. Stay tuned. I was recently in Florida and tasted Puerto Rican food for the first time. This lady used frozen plantains that she said she got at Walmart, and microwaved them. They were soft. I get that Cinnamon Cooper is Andrew Huff's wife/partner, but why in God's name is this post still on the front page?